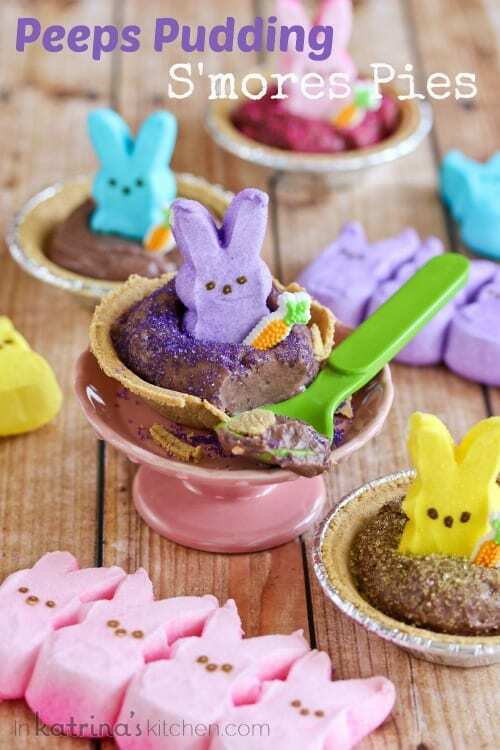 These Peeps Pudding S’mores Pies are a quick, cute, and easy Easter treat. Fun for kids to put together on their own! There are many things that I want to teach my boys as they grow up. One thing that I hope I instill in them is to surround themselves with great friends. Life is better when you can laugh at yourself. Our home is fun and FUNNY just the way we like it. People have commented that our life is like watching a TV sitcom. Like the time when a cashier wouldn’t take my husband’s credit card because he had a shirt with a name tag on it that said, “Hello my name is Inigo Montoya.” Serously people. I can’t make this stuff up. My husband and I laugh every day together. Life isn’t always happy but we enjoy it together joyfully. He has been making me laugh since I was 16 years old! We also surround ourselves with fun and funny friends who don’t take themselves too seriously. 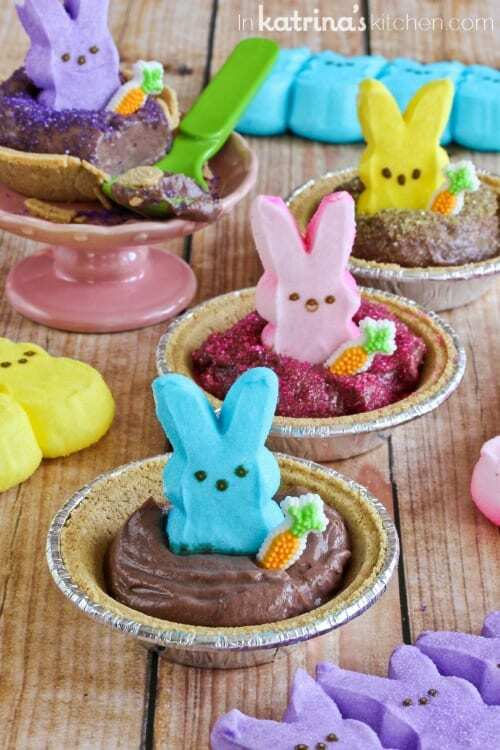 I made these Peeps Pudding S’more Pies for my friend Maralee. Although distance separates us now we have enjoyed staying connected since we graduated college. I keep her around because she makes me laugh. 😉 She tackles challenging topics like foster parenting, adoption, and more on her blog A Musing Maralee, but she always has a way of making me laugh (especially on her Facebook fan page). Maralee, this recipe is for you. I can’t wait to see your adaptation. 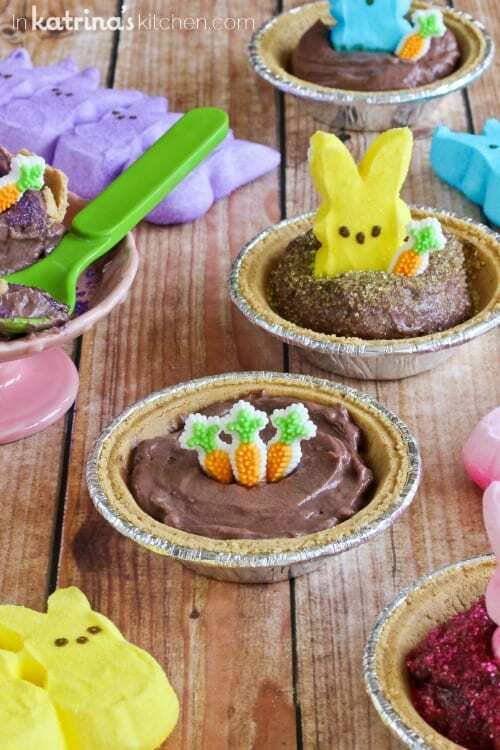 These Peeps Pudding S’mores Pies are easy and your kids will love putting them together in a jiffy. It doesn’t get much better than graham crackers, chocolate, and marshmallows, am I right?! 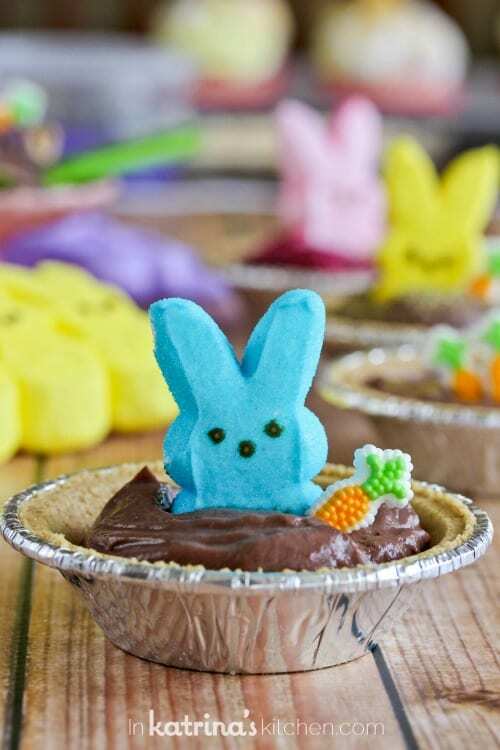 These Peeps Pudding S'mores Pies are a quick, cute, and easy Easter treat. Fun for kids to put together on their own! Divide prepared chocolate pudding among 6 mini crusts (approximately 1/3 cup in each crust). Top with a Peep candy and carrot. Top with matching colored sugar (optional). Chill before serving if desired. Switch things up and make these in a regular sized graham cracker crust if you can't find the mini crusts at your store. This is a perfect recipe for children to make independently! Lay out the ingredients and let them have fun! Those are so stinking cute! I am totally laughing thinking about what that nurse must have thought when she found your hubby pretending to be the Dr. LOL! You shut up with these. These are so stink in’ cute! And I love the stories with your family and friends! Fun and not taking yourself too seriously is the best! 1. OMG! My fiance has a shirt like that too-I cannot belieeeeeve that someone took it so seriously that they wouldn’t accept your hubby’s credit card! INCONCEIVABLE! 2. 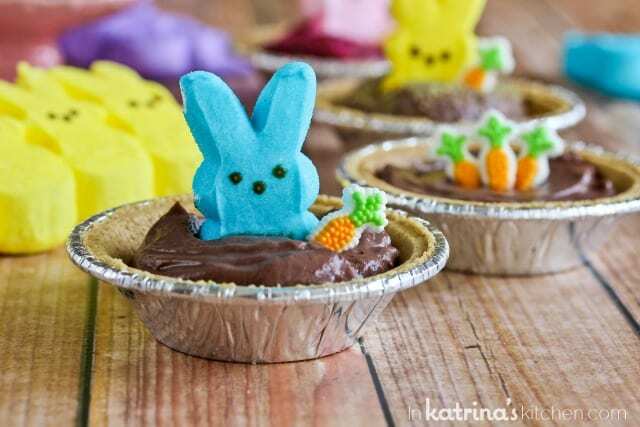 These are just the cutest thing-the pudding pies look so creamy and delicious and then yay for Peeps chilling out in em! The credit card thing happened to my dad! Except this was back in the days of checks. His uniform shirt said Mr. Goodwrench. People are so dumb sometimes! I love love love pudding pies! I don’t like pudding but put it in a crust and I’m all about it. Your little pies are adorable. And how great to be surrounded by wonderful people who make you laugh. Without laughter, what do we have? Whoa! I love Peeps and I love s’mores! What a great idea! I saw these last night and about died from their cuteness. made them today and the whole family LOVED them – huge success and it literally took me 3 minutes to make.